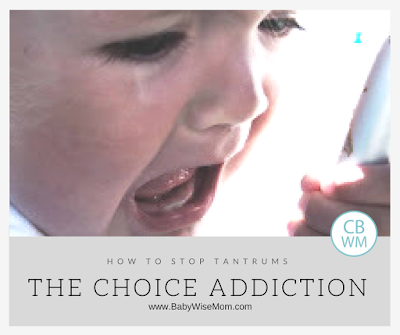 How to stop tantrums by addressing the choice addiction. Common choices given to children they shouldn’t have and how to stop the tantrums that go with them. 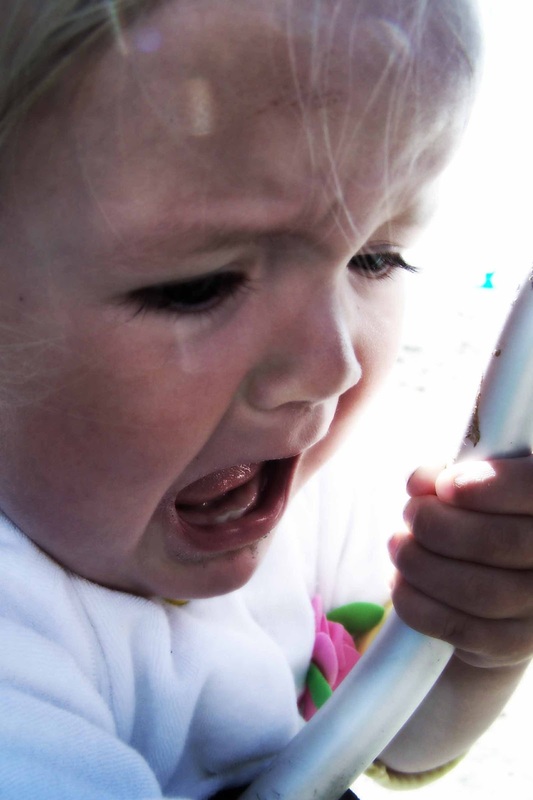 When a tantrum arises, there can be many causes of it. One that is wise to routinely consider is that of the choice addiction. 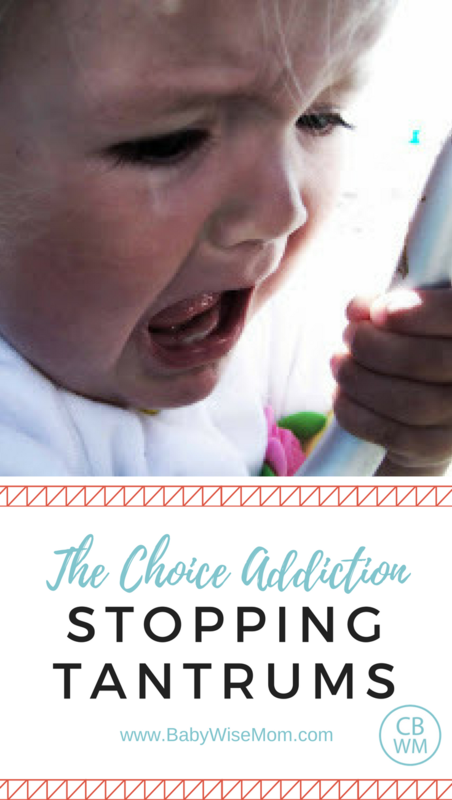 The Choice Addiction is a chapter in On Becoming Preschoolwise (affiliate link). I find it to be highly valuable, so I am going to summarize key points from it here. It is chapter 4 and begins on page 65. Wise in their own eyes. You know your child is this way if he does things he shouldn’t and says things he shouldn’t. Do you allow your child to make too many decisions? You have to be careful about this. Yes, you want your child to practice decision making and living with the consequences of those decisions. However, you don’t want it to get to the point that the child insists on making each decision. The example used in the book is of a 4 year old insisting upon the blue instead of red cup, grape instead of the orange juice already poured, jam instead of butter, reading in the spot he choses rather than where mom chose, switching the story, etc. All of these seemed like harmless decisions. However, it escalates into him refusing to eat lunch because he is busy playing. The mom then wonders why he won’t obey. Moral vs. nonmoral choices. The child doesn’t know yet which choices he makes are moral (obeying mom) and which are nonmoral (color of cup). He is so used to making every decision that he is resistant to any decision made by mom, often choosing something else just because it is different from what she chose. I am going to pause here and say that the majority of the time that I am experiencing behavior problems with Brayden, it is because he has too many choices. I try to mix things up. I do want him to understand what it means to make a choice and what it means to follow through with that choice. I will offer him a choice between X shirt or Y shirt. Both are shirts I would be happy with him wearing. Whichever shirt he chooses, he wears all day (pending some good reason to change it like he spilled water all over himself or something). He doesn’t get to choose which shirt to wear every day, just some days. I mix up the decisions I allow him to make so that he doesn’t come to feel entitled to any. Okay, back to the list. To give your child too many choices and give too much freedom to make decisions is to push your child developmentally. It is akin to pushing your child into an organized sport he isn’t ready to play. Hopefully you wouldn’t throw your child into that situation of playing a sport against kids before he is ready. It can also be compared to getting a tutor for your 18 month old to ensure her success in school. So if you start to feel guilty about not allowing so many choices, remember you are doing it for the good of your child. Someday he will be able to chose his cup and his drink every day. For now, you only give him control as he can handle it. Keep it in the funnel. Keep in mind that allowing too many freedoms (parenting outside the funnel) places burdens on your child. You expect him to handle things he isn’t capable of handling. It requires him to grow up faster than necessary. This problem starts with the parents, not the child. This is why I say that most of the behavior problems I encounter with Brayden are my fault, not his. I have done something wrong. Keep that in mind. While your child is misbehaving, it is because of something you have done, not because the child is “bad.” The good news is that you have more control than you think. You can control yourself easier than your child. The three most common freedoms granted with preschoolers are decision making freedoms, physical freedoms, and verbal freedoms. You want to neither over-control nor under-control. Be sure your child is developmentally, intellectually, and/or emotionally capable of making this decision. I think one way to gauge this is to observe how they handle the consequences of their decisions. How do you know if your child has too many decision making freedoms? Answer these questions. Can your child handle not being given the choice of what to eat? What about what to wear? If your child accepts your decisions without complaining, then your child can handle some freedoms in this area. If your child complains, protests, etc. then you know you have a problem. Does your child debate? Does he fall apart when an impulsive desire is denied? Does your child struggle to submit to instruction? Does he do what you ask, but do less than you asked for? If so, it is likely he has too many freedoms for his age. The real world doesn’t give in to tantrums. The real world won’t tip-toe around him to avoid tantrums. You won’t be doing him any favors if you allow him too many decision making freedoms. Does your child inform you of what he is going to do, or does he ask for permission to do something? “I am going to play outside” vs. “May I go outside?”If it is the former, there are too many physical freedoms for your child. There is nothing wrong with playing outside or wanting to play outside. You just want to make sure the parent chooses if this does or does not happen. To keep this problem at bay, you simply require your child ask for permission rather than simply telling you. You then cannot give in if a tantrum follows the “no.” If you do, the child made the decision anyway. Too many verbal freedoms include bossiness, rudeness, demanding speech, needing the last word, telling you no, etc. Don’t allow your child to operate under the impression that he is your verbal peer. You are the parent. To fix it, you simply require a “Yes Mommy” or “Yes Daddy” in response to your instruction. You can fix this, and easily. Here is how. You take back freedoms you have granted prematurely. Once your child demonstrates that he can accept your choices (this means no grumbling or whining), you can start to allow choices (though not the same every day). Have structure to your day. You guide your child’s activities. If your child throws tantrums at first, resist the urge to fix the problem. Is he throwing a fit because he wants something other than what you chose for breakfast? Don’t give in! It can take three days to three weeks or more to overcome. Remember children want to do what is right and want instruction and guidance from their parents. I find this chapter so valuable because I find the choice addiction to be the root of about 90% of behavior problems I experience with my son. Hopefully you can apply some ideas to your children. Of course, this is just a summary. It is a good idea for you to read the chapter and take what you can from it. I’m glad you found us Rachel! I wanted to add, for future readers, that mayasmom.com has moved to community.babycenter.com. fickchantellelee,See this post for more on the mini-fit and how to handle it:The "Mini-fit" : http://babywisemom.blogspot.com/2008/07/mini-fit.html For independent play, use a timer. Start with five minutes. When the timer goes off, go in and get her, and be really happy to see her (no "poor baby"). As she can be happy for the 5 minutes, work up over time. There is more on this in the independent play posts. This sounds similar to what I am dealing with and at a loss over. My daughter, 27months, will start screaming out of what seems to be nowhere. I think limiting freedoms will help, but will that help the random full out screaming fits?Thanks!